Two years ago when Marley was in preschool, she was bringing home tons of papers every day. 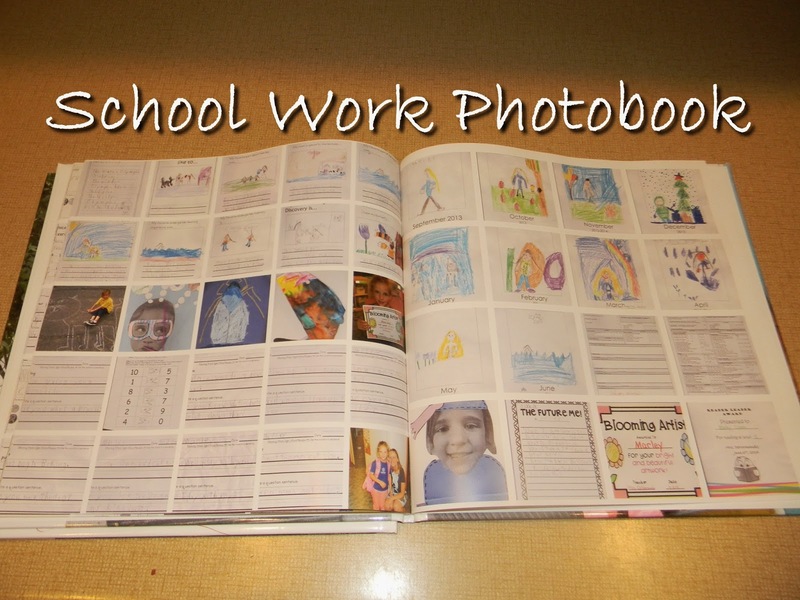 I hated to throw them out so I decided that I would make a school work photo book from Shutterfly with them. Every few weeks I would just scan in her papers, and then that allowed me to recycle them without feeling bad about it. Once I had them all scanned in I just uploaded them to their website and kept them in order of when she did them. The first 20 pages are included with the book, then it's an additional fee per page. I didn't want to go way overboard, since I actually got her preschool book free from Pamper's Rewards. To help figure out how many photos per page, I just divided the number of photos by 20 pages. Since it was an uneven number, I did add some photos from her field trips and class parties in there too. Some of her larger art projects required more space on the page so I just chose a different layout. I just finished her kindergarten book too, following the same steps as before. However, this time I didn't have a free code, so I had to wait for a good sale. Shutterfly's sales usually last a day or two so I really had to hurry to finish scanning everything and uploading it and rearranging it on every page. I had 23 pages and it was about $30 for the book and shipping. Not too expensive for a whole years worth of school work. I think for next year, I will scan and upload as I go so once a good sale shows up, I won't be rushing to make it before it expires. On the front cover of the book is her picture from the first day of school, and on the back is her picture from the last day. It's so crazy how much she's grown in just 9 months. On the spine I just put her name and the grade so when they're on the shelf I can keep them all in order. I don't know how long I'll continue doing these for her because once she gets into higher grades they bring home less fun projects and more work. I will start making them for Mason though in just a few short years.